Hallmark put out four different Halloween cassettes between 1986 and '89 during the peak of the Halloween cassette trend. 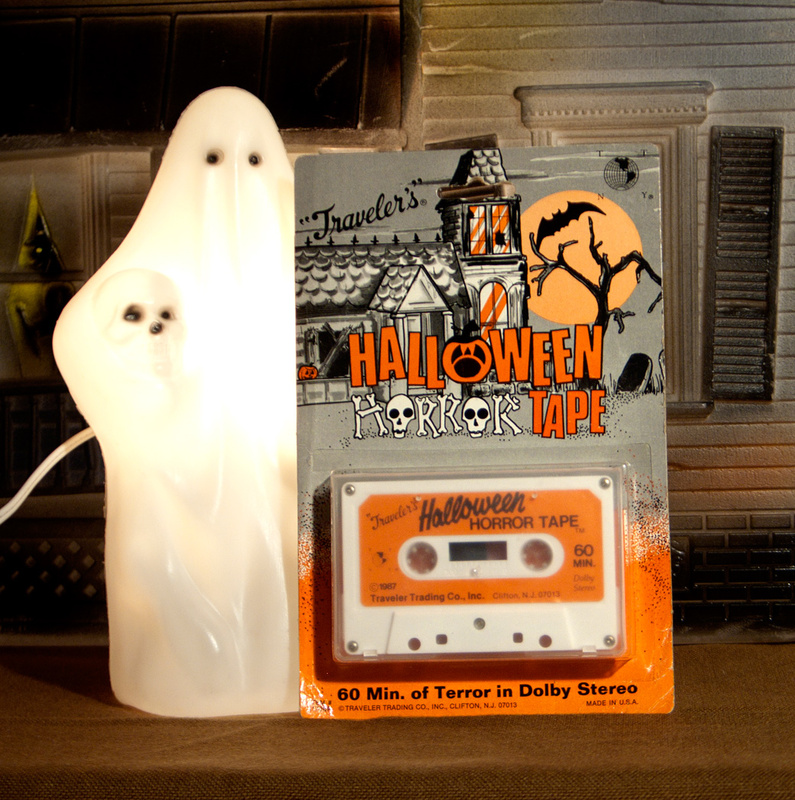 The tapes were part of their annual Halloween promotions. 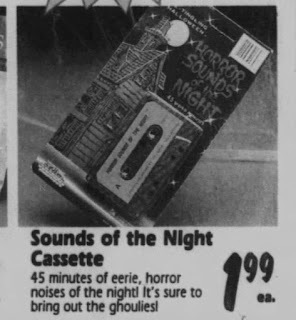 For example, if you spent five dollars, you could get a tape for $1.95 (Which really wasn't less than most Halloween cassettes at the time.) The first three releases share a great deal of content (see specifics below) while the '89 release was an all new recording. I have many questions about these tapes, and perhaps the answers rest deep in the Hallmark archives, but for now I'll happily rely on pure speculation. Review: Hallmark has always presented a grandma-friendly version of Halloween that complimented the discount store blood and disfigured monster masks. 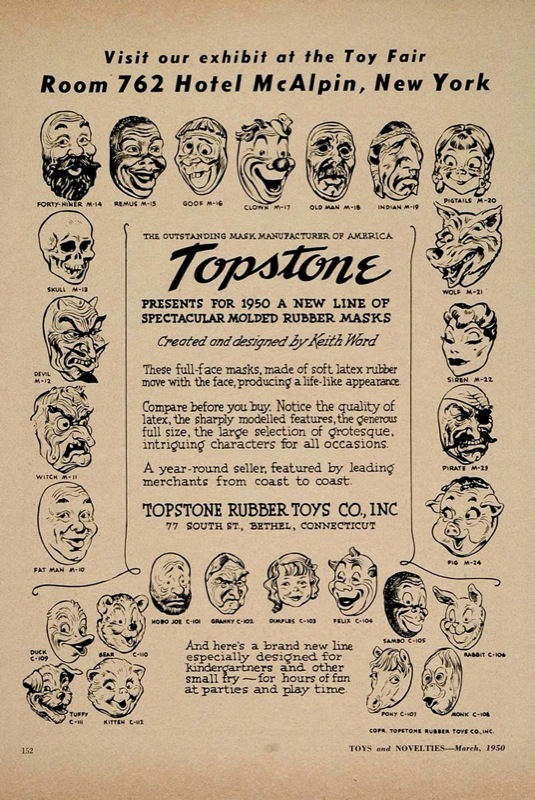 It often found its way onto teachers' desks and store clerk smocks, and I always welcomed the sight of it. 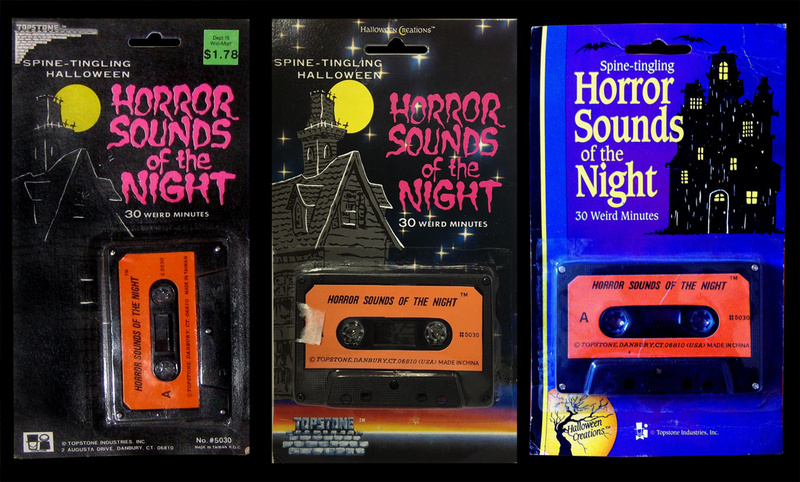 Naturally, their Halloween cassettes follow the same whimsical aesthetic. Rather than a harrowing soundscape, the Hallmark effects come at you methodically, and with a bit too much dead air in between each noise for my taste. The mood stays tongue-in-cheek as a handful of actors speak comical lines. Most are written to work with a trick or treat porch scenario like: "My, what an ugly costume." and, "Didn't the other kids tell you not to come here?" The effects in between are death-free; instead they focus on things like door hinges and cats. The Haunting Sounds of Halloween is the rarest of the four Hallmark releases. 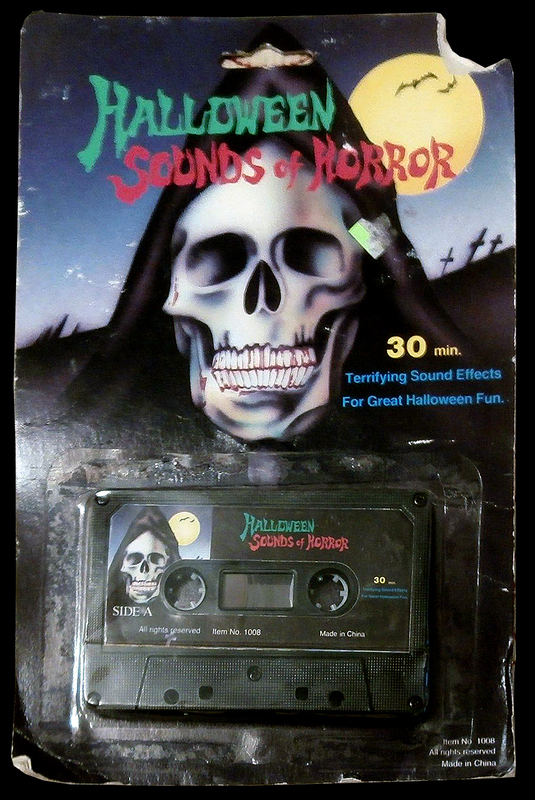 It was seemingly replaced the same year it came out with The Sounds of Halloween (see below). The assortment of sound effects are almost identical and presented in the same order. The difference is that Haunting Sounds repeatedly plays John Williams' theme to the 1979 version of "Dracula." There's also a synth track that I can't identify (and neither can the Shazam app) which doesn't necessarily sound scary. It reminds me of the beginning of an '80s movie. My sense of wild speculation tells me that the tape was pulled and replaced due to a lack of legal clearance on the music. (The credits only list Paul Whitehead after Music Production.) Was it supposed to be placeholder music, or was this intentional thievery, or just a misunderstanding? The answer to all of those questions is "yes." 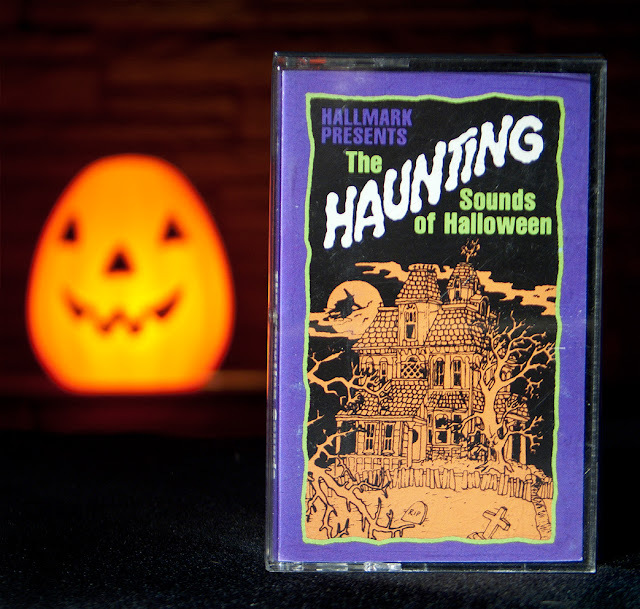 Legal or not, The Haunting Sounds of Halloween is well produced and creates an amusing, spooky atmosphere without traumatizing youngsters. Music: "Toccata and Fugue in D-Minor," and a bunch of Halloween friendly pop covers. Review: As mentioned above, the sound effects side of this recording is virtually the same as The Haunting Sounds of Halloween, but without the music (except for good ol' "Toccata and Fugue in D-Minor.") There are also added flourishes to existing sounds (like reverb) and a few added extras, like a monster roar after some dialogue, as well as some general shuffling around. Unfortunately, the edits take a significant bite out of the runtime. In what may be an effort to make up for this loss, side two is now full of Halloween party staples: "Ghostbusters," "Monster Mash," "Thriller," "Purple People Eater" and another dose of Bach. This was probably convenient in the mixtape era, but the downside is that the cover songs are a hollow shell of the original recordings. But that can be entertaining in its own way. The Vincent Price stand-in is delightfully droll, and completely loses track of the rhythm. They made the wise decision not to use a Michael Jackson impersonator, and opted for a female vocalist instead. Paul Whitehead is once again the music producer so it's nice to know he didn't lose his job after the first album. 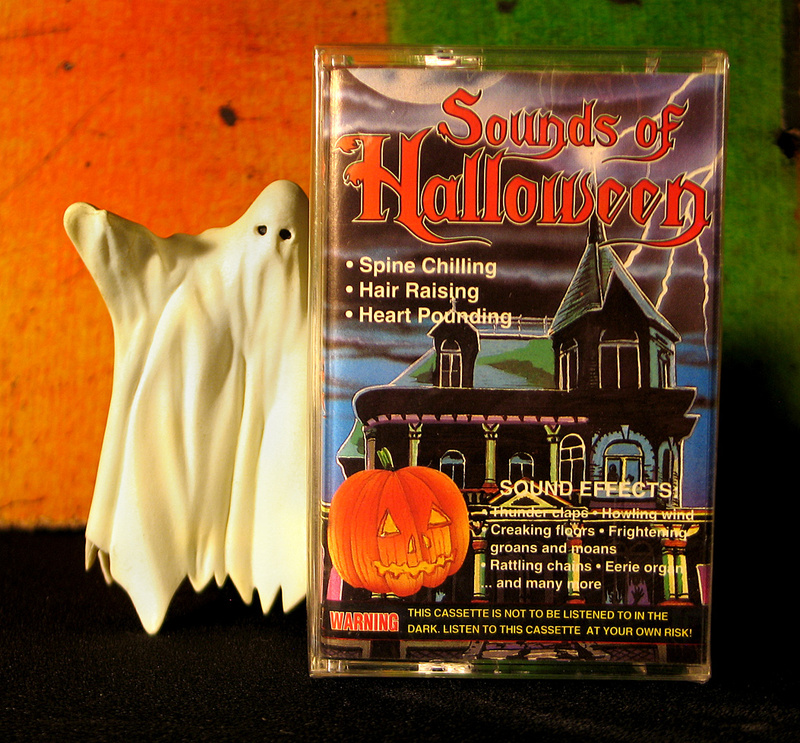 Sounds of Halloween suffered a loss after the previous release, but there's some new fun to be had. It's kind of a yin yang situation. 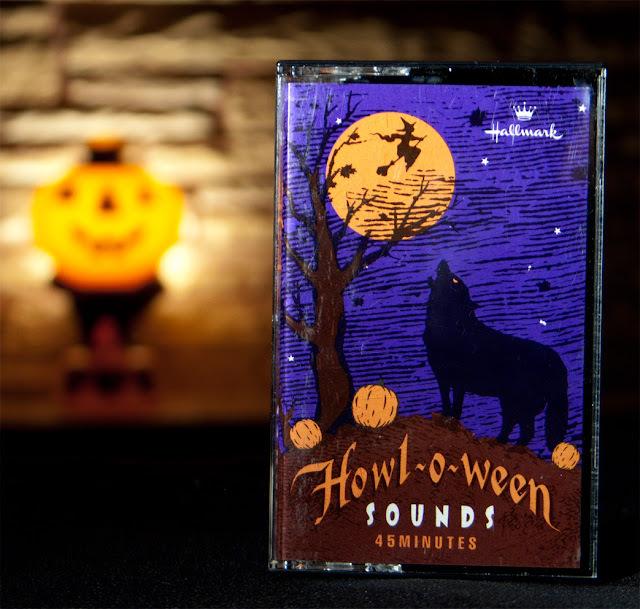 Music: "Toccata and Fugue in D-Minor"
Review: Howl-o-ween Sounds is easily the worst of the bunch because it includes the neutered effects of The Haunting Sounds of Halloween repeated on both sides. So there's no music at all except of course "Toccata and Fugue in D-Minor " which is a basic human right at this point. 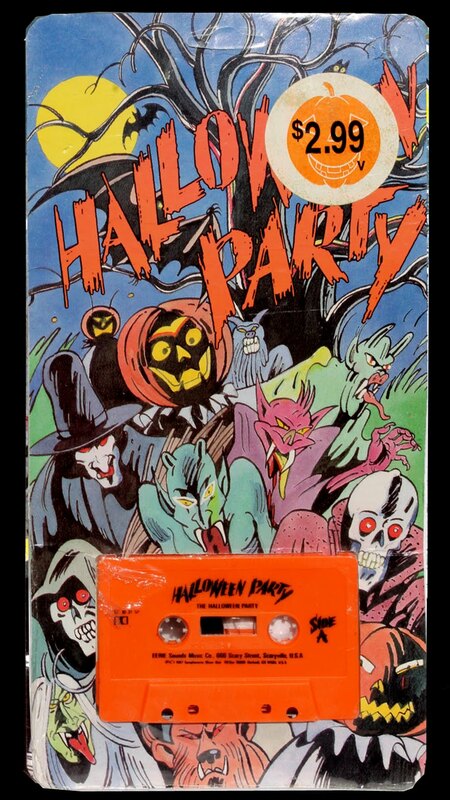 They released it a second time with a different cover, possibly to fill their Halloween tape void in 1988. 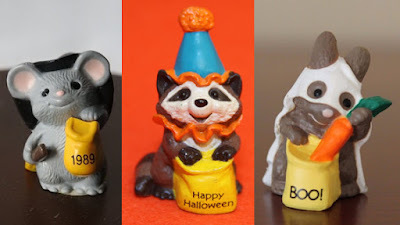 Howl-o-ween Sounds wouldn't be so bad if we didn't know what we were missing—but we do. They also went back to the half effects/half music model and filled side two with a set of newly recorded cover tunes that include: "The Munsters," "Monster Mash," "The Addams Family," "Ghostbusters," "Twilight Zone," "Dark Shadows," and an original called "Haunting Melody." 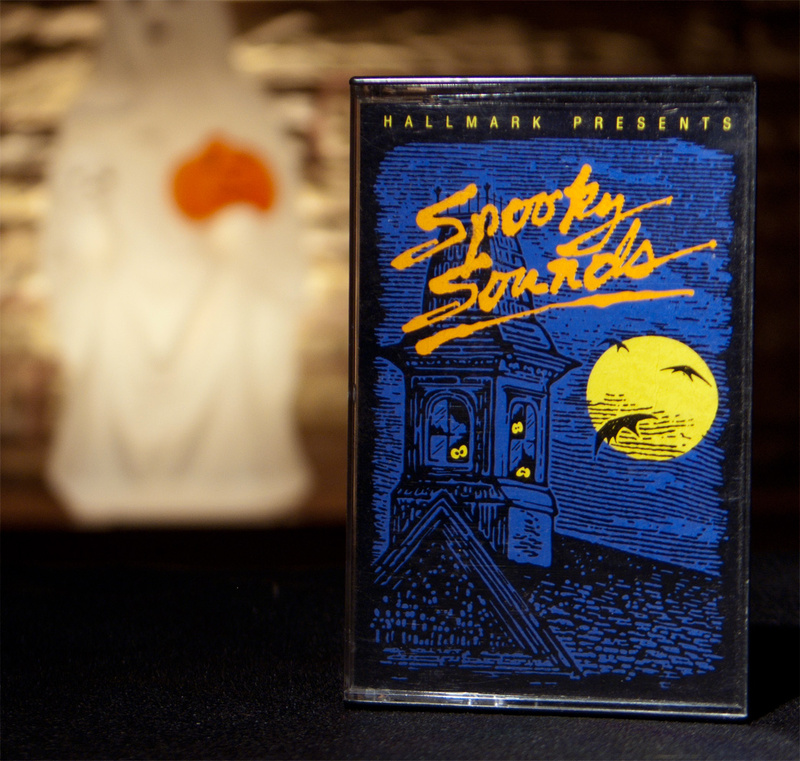 Spooky Sounds is a strong effort that proves that experience, and an ability to learn from one's mistakes can lead to new heights. Review: This less-than-official-looking version of Alfred Hitchcock Presents Ghost Stories for Young People seems to be a legitimate reissue of the 1962 album which was also produced by Wonderland Golden Records. 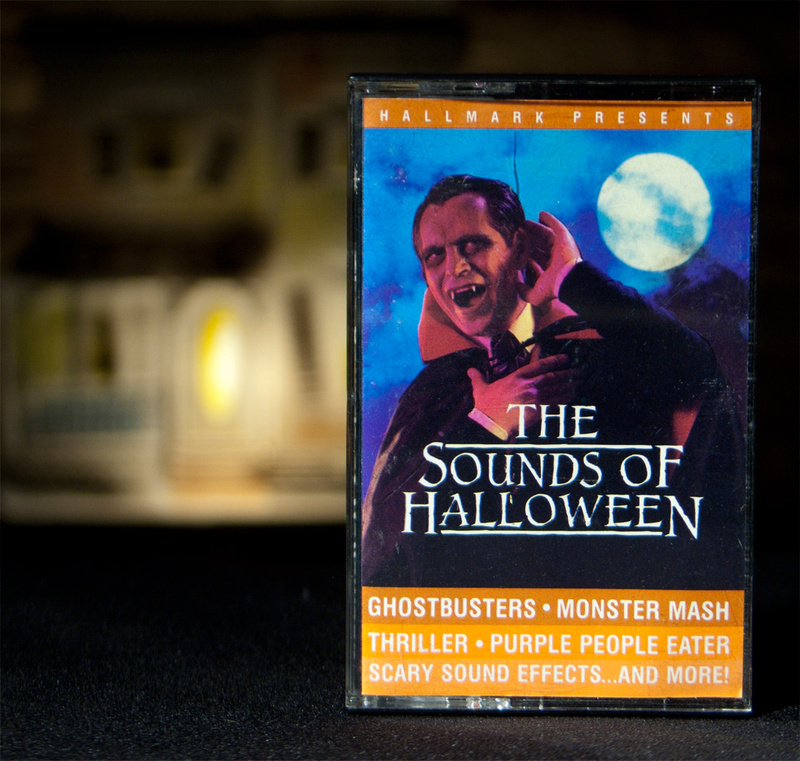 The decision to revisit the title in 1988 may have been due to the newfound popularity of cheap Halloween tapes, or it may have been an attempt to profit from the mid-80s version of the "Alfred Hitchcock Presents" TV series. Alfred himself provides a 'wrap around' for the six stories. They are expertly narrated by John Allen, and enhanced with an effective soundtrack. The tales come from all different sources, and some may be familiar to those already interested in the genre. "The Haunted and the Haunters" seems to be a loose interpretation of Edward Bulwer-Lytton's 1859 short story of the same name. Its tone is a bit more dire than the rest, which are rarely frightening. "Johnny Takes A Dare (The More The Merrier)" is very similar to "Wait 'Til Martin Comes Home" as it appears on Scary Spooky Stories (1973). "The Helpful Hitchhiker" is the same urban legend that inspired Red Sovine's "Phantom 309," and the Large Marge scene in "Pee-Wee's Big Adventure (1985)." 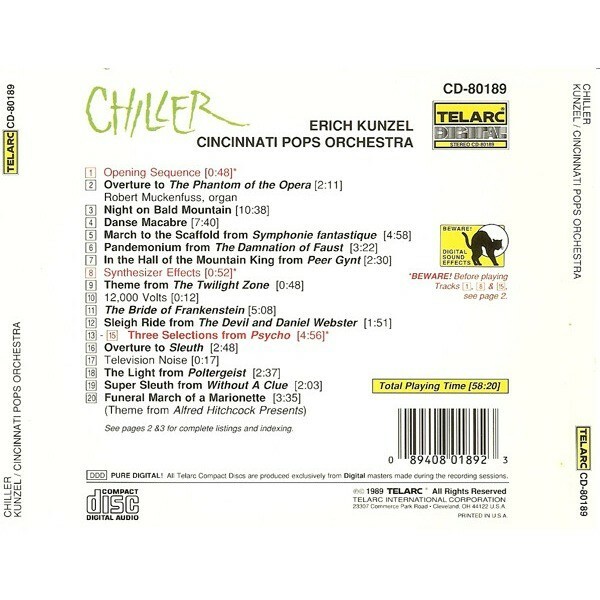 "The Open Window" by Saki was first published in 1914, and a different recording of it appears on Troll Records' Thrillers and Chillers (1973). "Jimmy Takes Vanishing Lessons" was first published as a Childrens book in 1950. 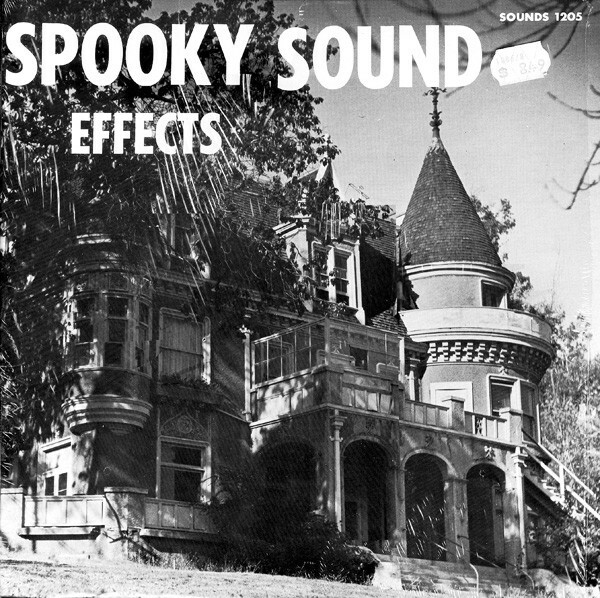 Though the source material isn't always the strongest, it's fun to light up a room with the spooky sounds of yesteryear. It's also three hundred times better if you listen to it with a kid. Review: Back in high school, discussions about audio fidelity came up often because most of my friends were finally making the leap to compact discs, one Christmas and birthday at a time. My friend's audiophile dad taught us about the SPARS code, a three letter sequence printed on the discs that told you "how digital" an album was. So "AAD," the least desirable in our eyes, meant that an album was recorded in Analog, mixed in Analog, and Digitized for CD. Of course the ultimate was pure "DDD" because nothing sounds better than digital, right? ...Right? I raced home and examined my collection of about ten CDs. (Thank you Columbia House music club.) Not a single triple D in the bunch. What was the point of even buying CDs?! (Aside from sound quality, durability, instant access to individual tracks, and so on.) This feature suddenly rose to the top of my list of things to look for in a compact disc, ranking slightly above the recording artist and album. What a classic case of ruining something I vastly enjoyed just because the grass seemed greener elsewhere. It's more ridiculous when you consider that my "sound system" came from JCPenny and had three inch speakers. Triple D PURE DIGITAL! The cherry on top was a mysterious "Digital Sound Effects" warning for certain tracks. In the parking lot I tore open the booklet and read that these three tracks should not be played at high volume at the risk of damaging you speakers because the sweet digital fidelity is so powerful! I couldn't get home quick enough. The first time I played Chiller I cautiously kept the volume dial around the "one" mark. I could hear a burst of lightning. I re-listened a few more times inching up the volume with each play. It's true, the warning tracks are incredibly loud, though I don't think my portable boom box was in any danger. But on a large system that thunderclap could give everyone in the room a heart attack. On the other hand, I wasn't used to music that could get so quiet. There's such a dynamic range that the soft parts are nearly inaudible on low volume. But this has a great affect on songs like "Funeral March of a Marionette" when the first burst of percussion can give you a true jump scare. I realize all of this has nothing to do with the cassette. I got the tape in a lot of unopened Halloween audio, and I don't plan on breaking the seal because I still have that delicious digi-clean DDD compact disc. Chiller is more than just a well recorded album. 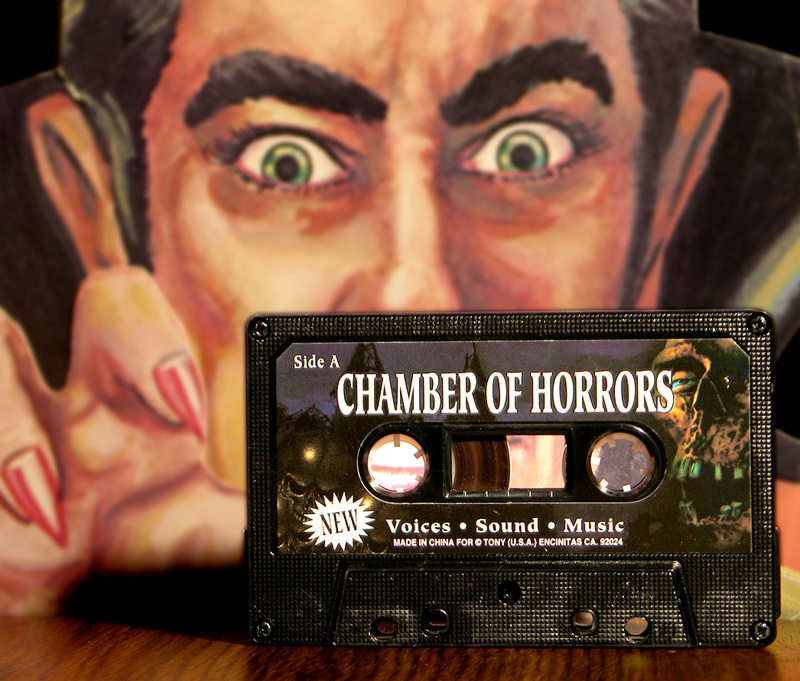 It's a collection of seminal Horror music in the hands of experts. Also, the letters on the cover glow-in-the-dark! I can't find a streaming link, but it's on Pandora and itunes. Distinct Audio: "My baby! Have you seen my baby?" 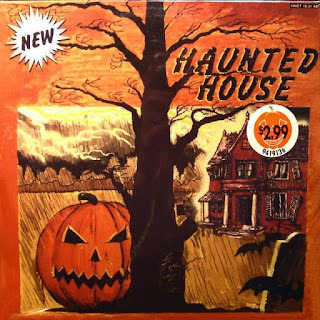 Review: It seems that A&M Records took note of a sales trend that started with the massively successful Disney's Chilling, Thrilling Sounds of the Haunted House (1968) and continued with albums like Sounds to Make You Shiver (1974) and Ghostly Sounds (1975). Their response was Halloween Horrors. This seems to be the only Halloween album released by a major record label (if you don't count Disney). It's also the only one I know of that uses the genuine Dolby "B" noise reduction system. 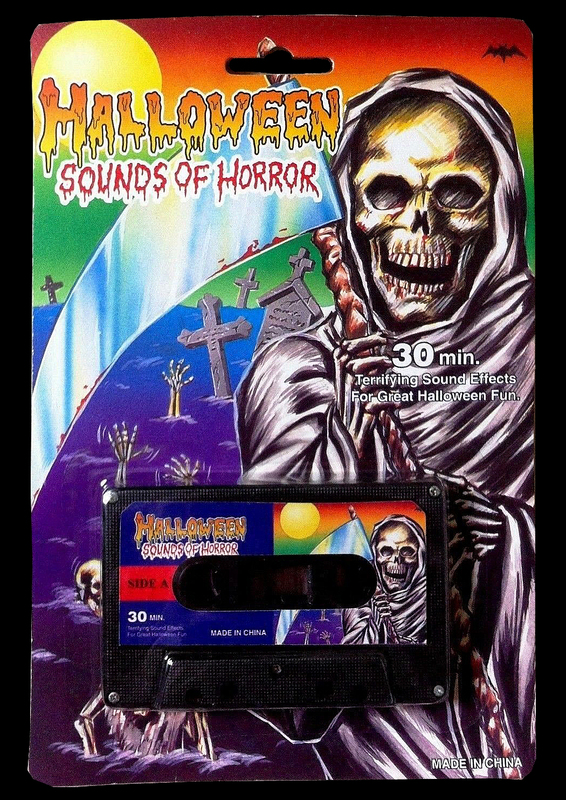 Printing a blurry Dolby logo on the back of the sleeve doesn't count; sorry Night in a Graveyard and Haunted House. 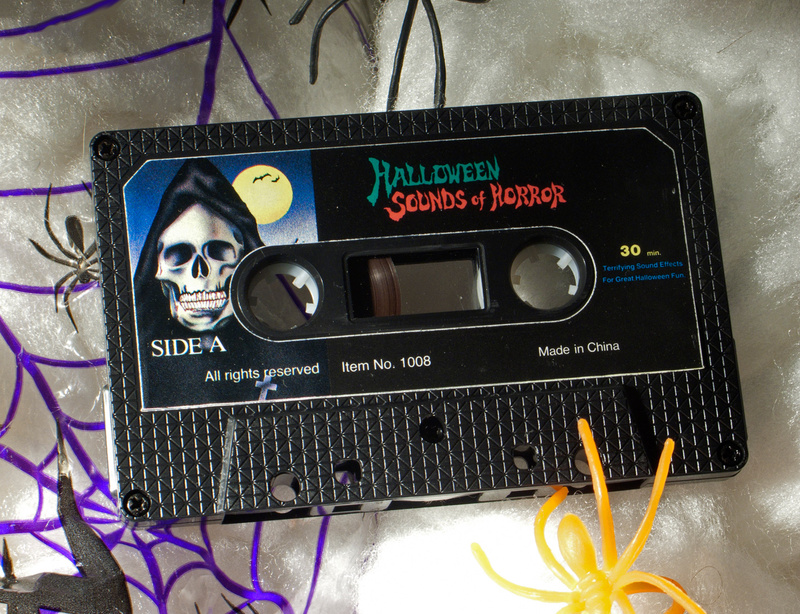 It's also likely that Halloween Horrors had one of the all-time biggest Halloween album budgets (which isn't saying much). This would explain why their search for voice talent was not limited to people who happened to be sitting in the office that day. They employed actors Michael Bell, and Peter Cullen who are probably best known for their work on G.I. Joe and Transformers cartoons of the '80s. The spectacular cover illustration comes from Gary Meyer who also did movie posters for "Jaws 3," The Deep,""The Exterminator 2,""Jason and the Argonauts," and more. His artwork is best experienced on the vinyl edition. Not only is the cassette insert tiny, it omits the wonderful back cover that is seen and discussed here on Branded in the 80s. 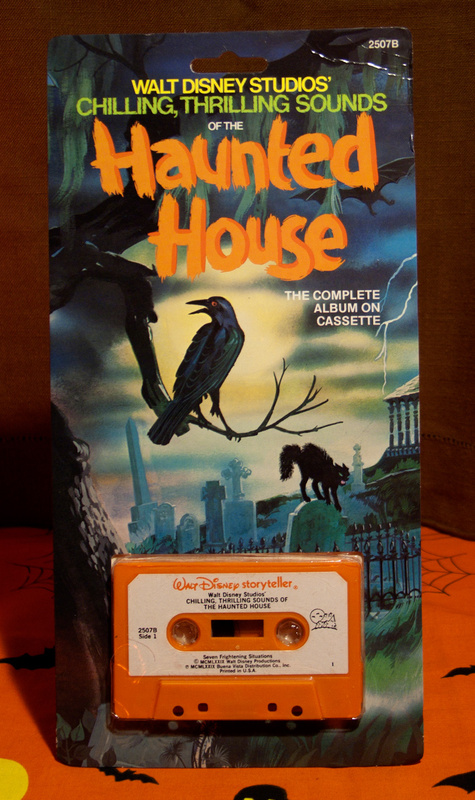 Side one features a fifteen minute "Story of Halloween Horror" that follows a young man visiting his newly inherited haunted estate. He recounts several legends surrounding the house during his drive over, and his visit confirms the tragic history. I first heard this at a dinner party when I was in fifth grade. 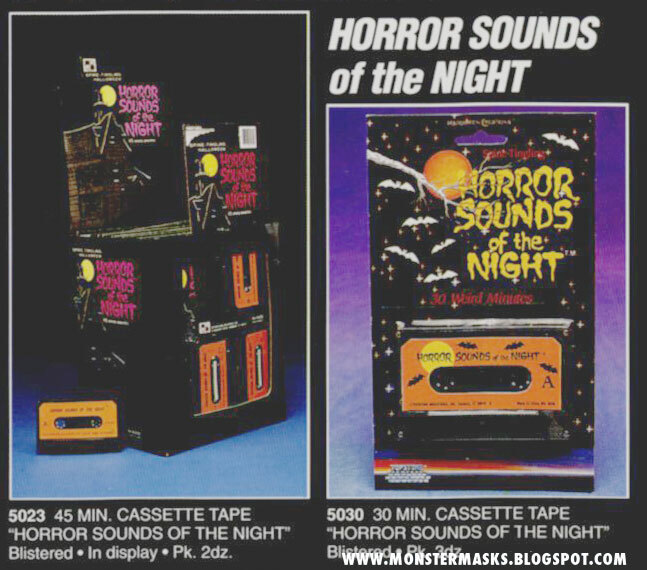 Shortly after meeting the two brothers of the household they dragged me into their bedroom and insisted that I ignore their room full of exciting new toys, and give my full attention to their mysterious cassette tape. As the story progressed I was afraid that I was hearing something that I shouldn't have been. I wondered if their parents even knew what they'd gotten their hands on. During the climactic ghostly encounter the distress in the young man's voice and the distorted cries of the apparition struck me at my core. My parents had no idea why I was acting strangely for the rest of the night. 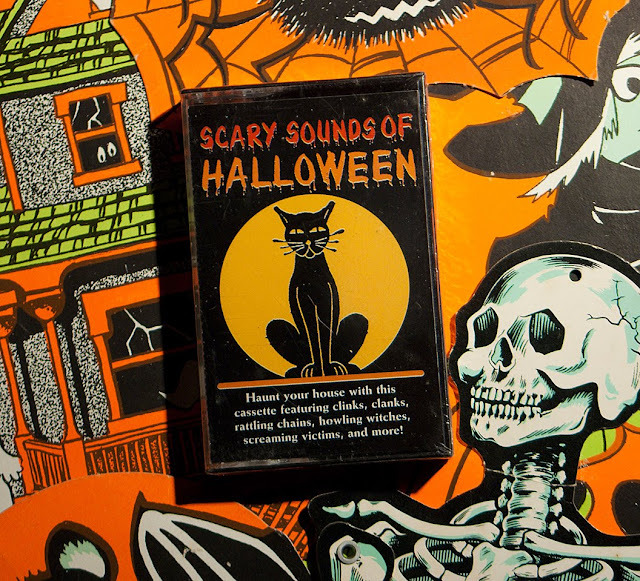 Side two features "The Sounds of Halloween and other useful effects." These certainly proved useful for the countless record companies who strip-mined the record for some easy cash. 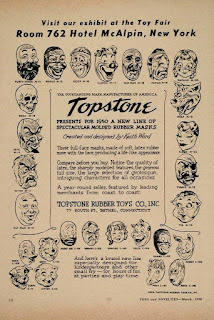 For people like me who are tired of hearing all the thieves and imitators it's a treat to tap into the source material. Halloween Horrors set the standard for Halloween records and it remains a true classic. Review: Connie Regan and Barbara Freeman are the storytelling duo known as the Folktellers. 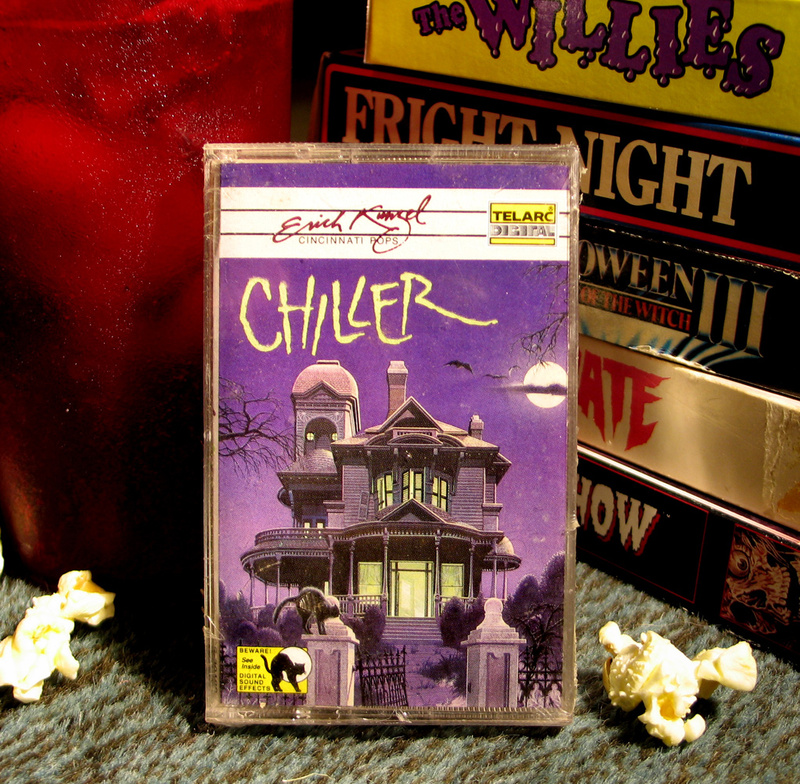 Chillers captures their 1983 Halloween night performance for a live audience. The receptive crowd is treated to seven eerie tales and poems that consist of both original and borrowed material. This type of event reminds me of the sort of thing that would take place at our small town fine arts center. Something the English teacher would talk up for weeks, and even give you extra credit for attending. I can imagine my young self going to please my teachers, getting thrilled during the show, and leaving the auditorium to discover that the world is colder and more dangerous than I remembered. The Chillers packaging feels educational. A gold sticker marks its status as an American Library Association notable record, and the cover illustration on heavy, textured paper somehow reminds me of art class. Maybe that's why it's surprising when the stories strike such a dark, and genuinely eerie tone. 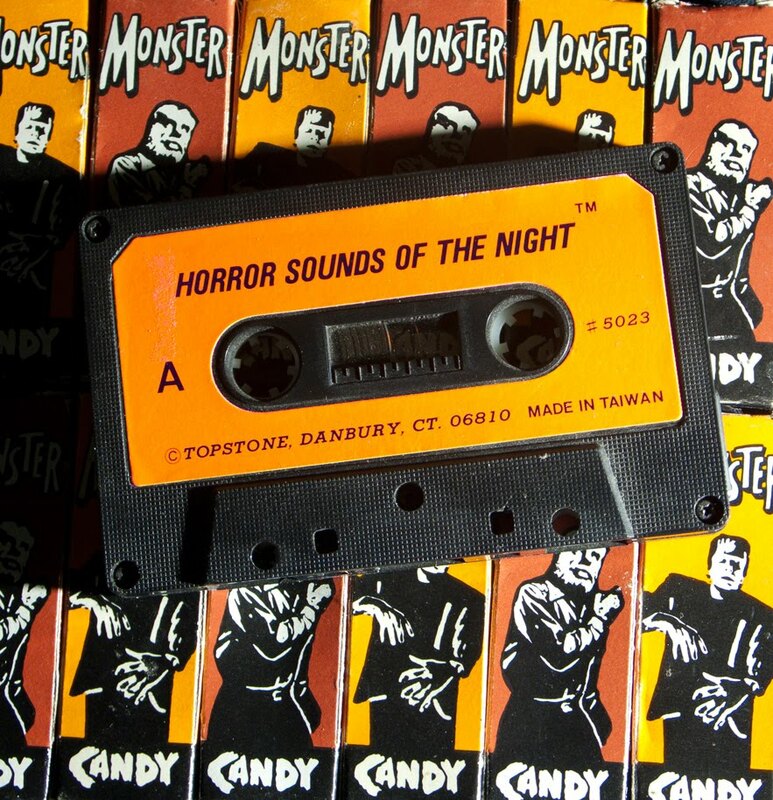 Please indulge me here, but this album unlocks a floodgate of memories, and reminds me of the role that school played in making Halloween special. It started when I was a first grader going about my business when my teacher, so casual and unannounced, stuck a life-size Dracula on the wall. It didn't seem possible. It seemed like something she could get in trouble for. As a kid you have so little control of your daily routine, and all of the sudden you find that your curriculum is sprinkled with spooky events that you didn't even have to ask for. Bats, ghosts, and pumpkins magically appear in the halls. The library display is full of books you didn't know they had: Alfred Hitchcock short stories, books on monster makeup, Halloween craft ideas and more. The school book orders suddenly rival the Christmas Wishbook. In music class we were required to learn the Halloween song and Ghost of John. We were graded on our ability to be a creepy kids chorus! 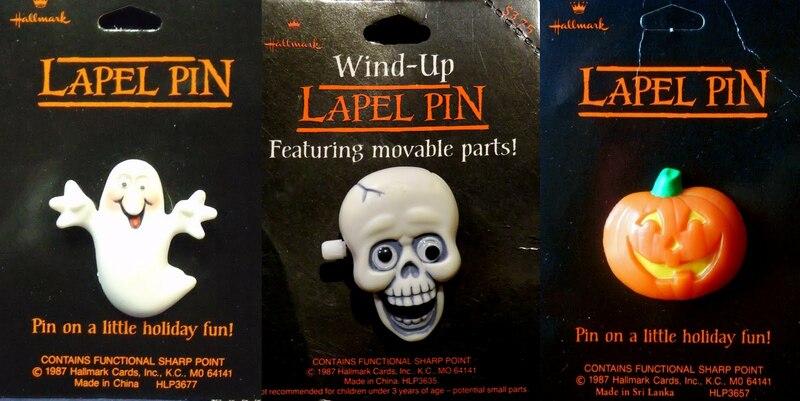 Our parents' tax dollars went towards teaching us to make proper skeletons and Jack-o-lanterns in art class. Everyone got marched to the library for a surprise screening of "The Legend of Sleepy Hollow," just thrown into a Wednesday afternoon! October 31st wasn't even close to a normal school day. After blowing off the morning, the costumes went on and we were systematically paraded through other classrooms to be admired. Exotic students from older grades were brought to our hall for the mutual show-off session. Everything culminated with a personal desktop full of orange and black sweets. The plastic cupcake toppers were worthy decorations in their own right. Three decades later I still have some of them. After a satisfying night of trick or treating we returned to school for... the Halloween carnival. The building was hard to recognize with all the streamers and balloons and costumed crowds. Classrooms were midway games, the cafeteria was a festive town square cloaked in the scent of popcorn. The sixth grade locker corridor that we passed through every day had become a walkthrough haunted house! Behind massive sheets of black vinyl were hidden student council members, bloodied up and waiting to scream at us. The fact that it all happened in the school setting made it incredibly surreal. Only Halloween had this much transformative power. Sorry, where was I now? Ah, yes, the record. A week ago we played through Chillers as we sat around my backyard fire pit under the October moon. It was ideal. 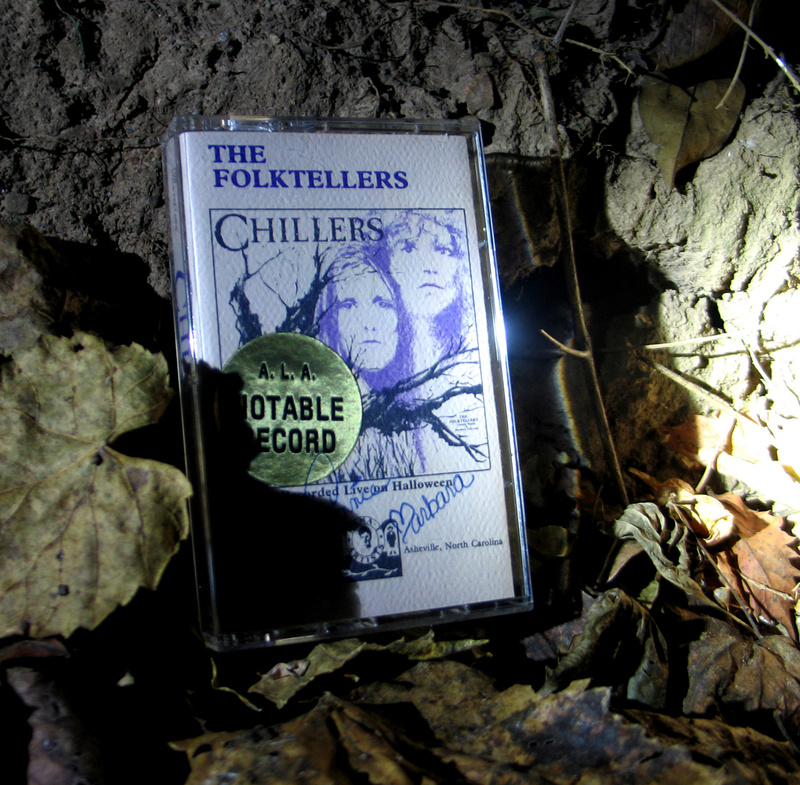 The Folktellers, true to their name, use their charming accents and seasoned storytelling to tap into the fireside tradition. Their rural nightmares could have happened last year or last century. It's Halloween listening at it's best. I can't find a source for easy streaming, but the album is out there if you know where to look. Of course Elvira needs no introduction. Thanks to her we have the only Halloween recording with a celebrity endorsement. She followed the product from inception to completion, hand-picking the individual sound effects, and providing constant input during the engineering process. Not really. But she did record a one minute introduction. 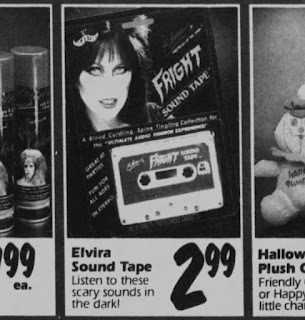 According to an article on Dinosaur Dracula, a store called McCrory's was selling the Elvira tape in 1988 for $2.99 while Topstone's Horror Sounds of the Night was a dollar less. 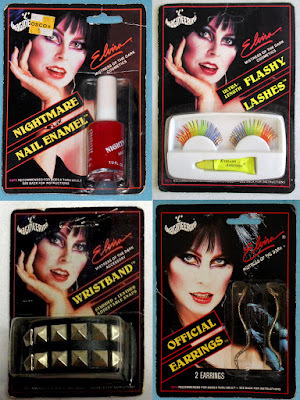 This could be due to Elvira's licensing fee. Or maybe it's because Topstone could charge less since all of their content was stolen. 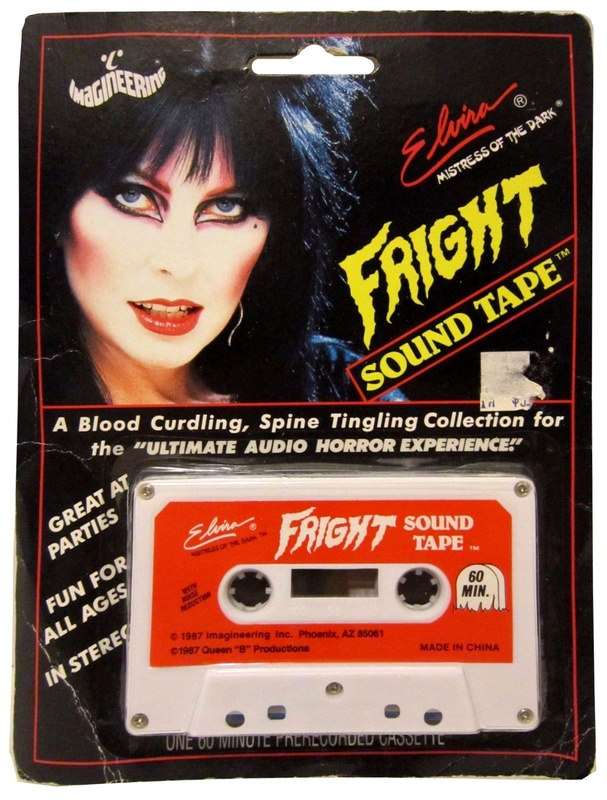 Fright Sound Tape comes from a line of Elvira products that also included costume accessories and makeup. 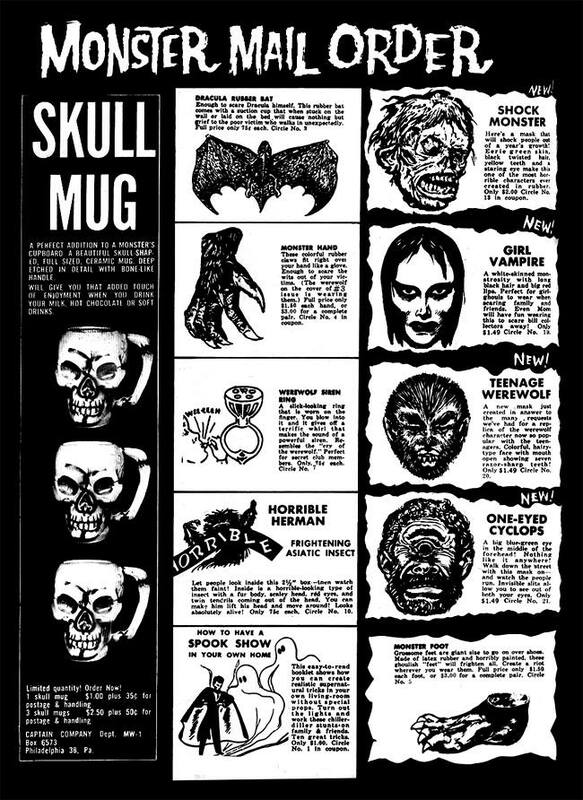 Most of it looks like existing products that were rebranded with the awesome exception of Elvira's official snake earrings. So does the tape live up to its iconic heritage? Side one has a good variety of effects that are inherently spooky; antagonists and victims as opposed to stock thunder and slamming doors. Wind is overused but it ties everything together. It's like sitting on your porch on the windiest night of the year, and all this crazy, monstrous stuff just keeps happening for a solid half hour. The second half hour, side two, has a very different vibe. I wouldn't be surprised if it came from another source entirely. It's dominated by a man with a distinctive laugh who occasionally says "Come here." and, "Come to the Haunted House." He gets tiresome, but there's something about his maniacal yet casual tone that draws me in. It's like he wants to kill me, but he's a little too sleepy. 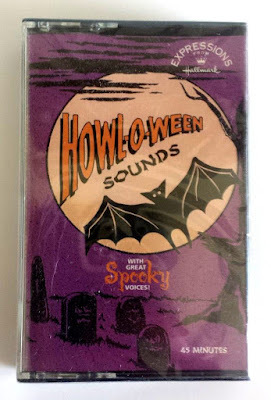 Unlike side one, I recognized a lot of the effects: cats, monsters, and the "Lonesome Ghosts" scream (that I discussed in this review). What ruins side two for me are the unrelenting bursts of reverberating noise. It sounds like bits of reel-to-reel recordings that are sped up and processed to death. It's definitely unique, but it makes me miss the constant wind from side one, and I rarely miss wind. All in all, I think the tape is better than average, but it doesn't reflect the remarkable entities behind it. Although, as a horror hostess, Elvira can't be held accountable for the content. Her job is to present the world with the spooky fun stuff, and it's our job to have spooky fun with it. Repeats on both sides: ? Review: As you can see, I have this tape in its wonderful packaging. I refuse to open it, and I can't find the audio online. So if you have it, then please let me know how it is. Review: A Spooky Night in Disney's Haunted Mansion is an adaptation of the Haunted Mansion ride as seen through the eyes of two original characters, Mike and Karen (played by Ron Howard and Robie Lester). Originally released in 1969 on LP as The Story and Song from The Haunted Mansion, Disney made the odd decision to reissue this remastered version exclusively on cassette in 1998, though the format was already passe. The CD didn't come out for another eleven years. I listened to an abridged version of the story (on a Donald Duck record called Trick or Treat) for many years before I grew the courage to experience the attraction. My intimate knowledge of the record only enhanced my first ride. It was like visiting an exotic land after studying it for a lifetime. 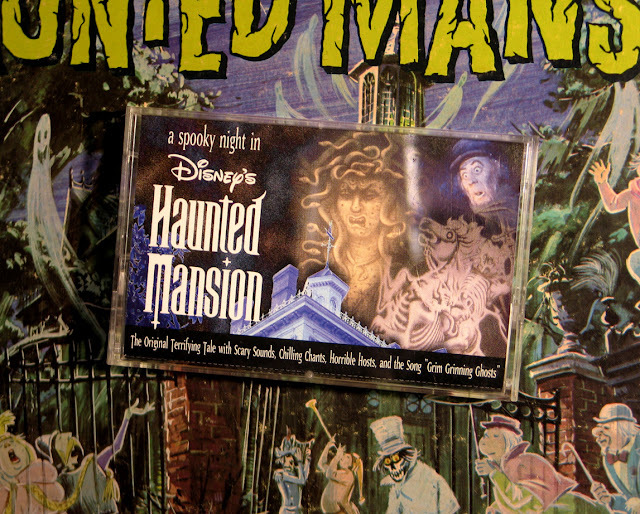 I can't objectively talk about A Spooky Night in Disney's Haunted Mansion. 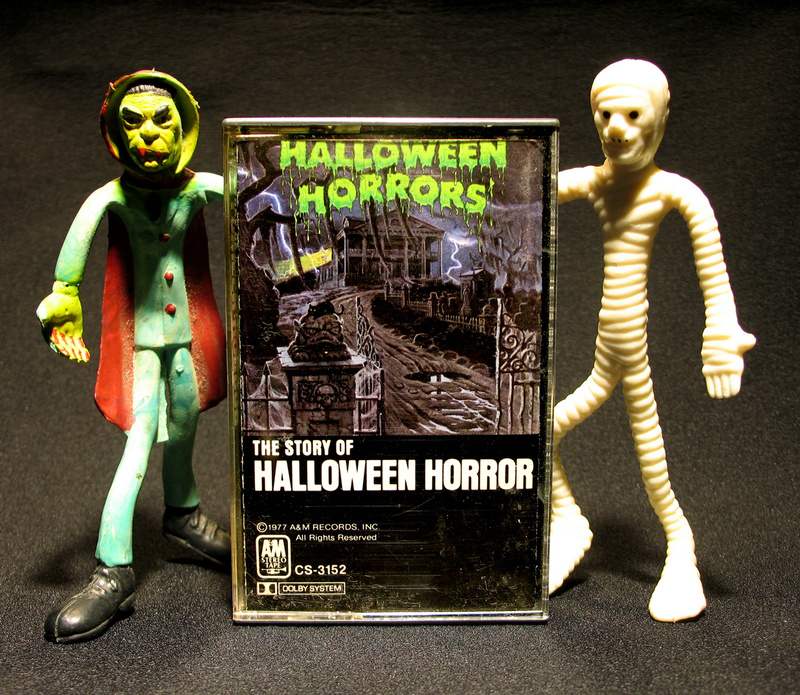 To me it is a warm, swirling stew of childhood, history, and horror. 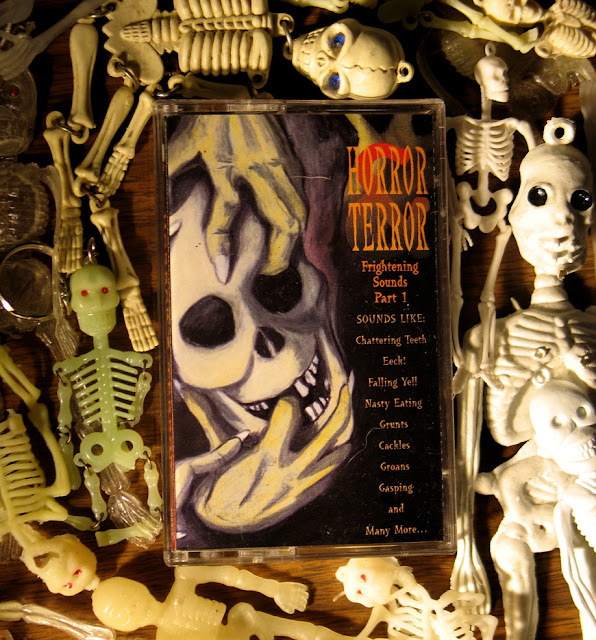 Music: A few musical bits with names like "Warped Chords" and "Melted Melancholy"
Review: Coincidentally, right before I sat down to review this tape I saw this bit of trivia: "Terror is usually described as the feeling of dread and anticipation that precedes the horrifying experience. By contrast, horror is the feeling of revulsion that usually occurs after something frightening is seen, heard, or otherwise experienced." via Wikipedia. Thing is, I would have probably made fun of the name for being redundant. I was also going to assume that there was no 'Part II," and it turns out that it does exist. I have grossly underestimated this tape. 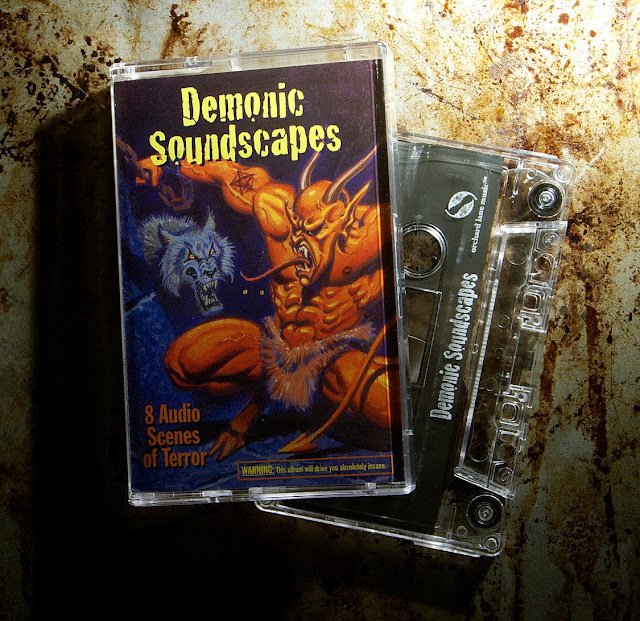 The first effect, 'Demon Drill,' is interesting because the sound of the drill has been remixed and put to a beat. It actually sounds like a segment of a Nine Inch Nails track. Unfortunately, this unexpected burst of creativity is gone by track two. The rest of the album is a collection of unrelated sounds that makes it seem like a production FX library. Maybe half of the content qualifies as spooky. It's very generic with the exception of a few pieces of music, a couple soundscapes, and a brief assortment of farts. My favorite thing about it is the simple, yet artful cover. I hope you enjoy looking at it because I can't find the audio online. Pro: It's from K-Tel. Maybe I've been brainwashed from seeing at least one K-Tel record ad during every commercial break of my childhood, but I think K-Tel is a cool company. 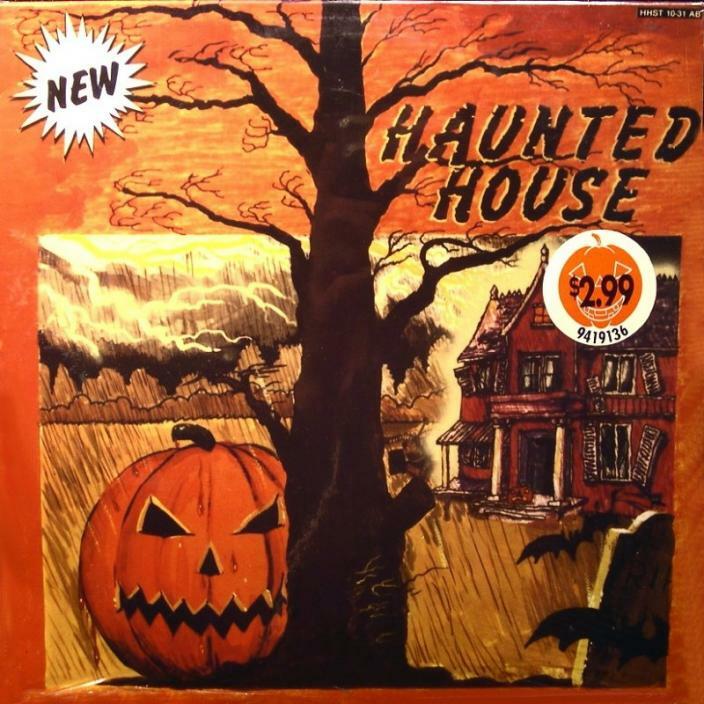 If they would have put out some AS SEEN ON TV Halloween records, I would have melted on the couch. Con: Cat noises that sound ridiculously human. About as effective as just saying the word "meow." Pro: Classic sound effects. It opens with the familiar wolf howl that we associate with all our favorite scary shows. Then the underused, yet universal "OooOOOooeeeEEEoooo!" ghost noise appears too. Con: The grunting monster won't shut up. This guy seems to be the star of the tape, but he quickly loses his appeal. He's pervasive, high in the mix, and sounds way too much like Jabba the Hutt. Pro: It includes a crying effect (at 17:54 in the video below) that was used in the video game "Left 4 Dead" to indicate the presence of a witch. This sound has conditioned players to go to on high alert and turn off their flashlights, lest they agitate the insanely powerful witch. Con: It's very repetitive. That is, until the end of side two when it sounds like a completely different album. Pro or Con: There's a Sci-Fi theremin type sound that brings to mind the noise that Greg Brady makes when he stages a phony UFO encounter. The recording is a lot like the cover. There are some classic elements, there's one beast that dominates it, and overall it's a bit generic. Music: A segment called "Midnight Music" that sounds like it's from "Night of the Living Dead." 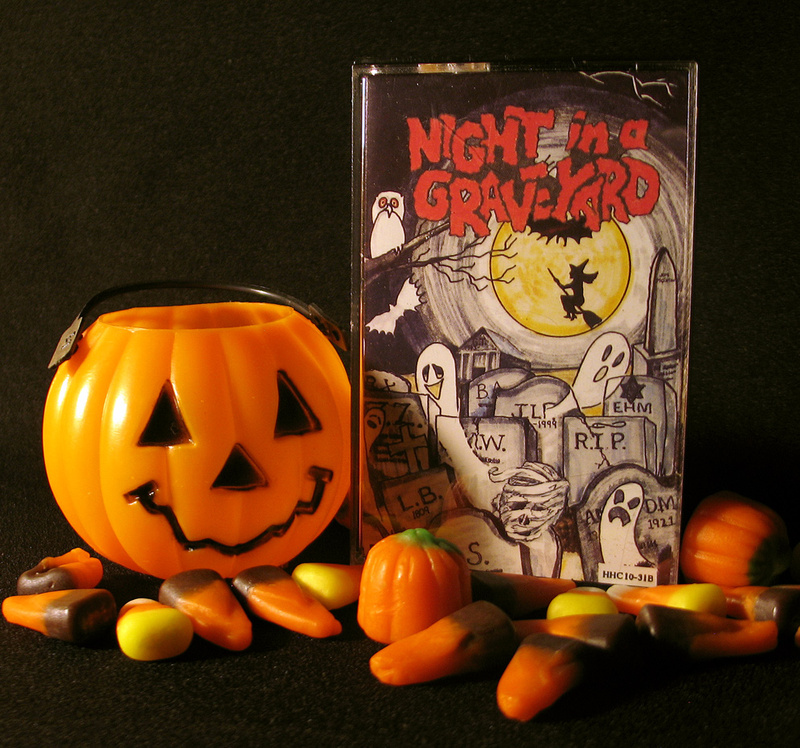 Review: Night in a Graveyard is one of the three Halloween albums released by the "Haunted House Music Co." in 1985. I like to think of it as a non-musical option to its companion, Haunted House, for those times when you feel that music will diminish the experience. As side one began he was skeptical. "They really overuse the wind. Pretty sure trees don't do... whatever that is, very much"
"Is that crying, or maniacal laughter?" "I've never heard a cat make that sound." As his mind struggled to make sense of the soundscape, he formed a scene. "Makes me think I'm hiking up a stone staircase, going up a mountain to a cave. Bats are flying out, and witches are inside." He gave purpose to some random cries. "Sounds like someone's lost, scared." "Sounds like the ghost host from Disney." Side two is full of random, individual sound clips that seemed to stoke his imagination. "Sounds like if dogs were at a play, and they were really not liking it." "Sound like if a giant were trying to sew, and kept poking his thumb with a needle." "Sounds like Donald Duck on laughing gas." Though he's never seen a horror show he understood what the "Midnight Music" is about. "Sounds like the part in a horror movie where the murderer is in the house creeping around with a knife. Everyone's like, 'Where is he?'" "I liked it. it was kind of cool. It had a lot if different things in it... variety." Rating: "3 or 4 out of 5"
Seeing how these tapes have been playing constantly in our house for weeks on end, I didn't expect him to get spooked. So I was surprised when he was too uneasy to take the recycling bin to the garage (one of his weekly chores) after our listening session. I offered him a flashlight and encouragement, but his solution was to invite our dog along on his dark journey. Then a few minutes ago he asked me to investigate a face he saw in the ceiling vent. Tonight may be a long night. Review: Haunted House is chintzy and samey, and I love it. What puts it high above the rest is the music. There is a constant ethereal droning that keeps the listener in a state of unease. 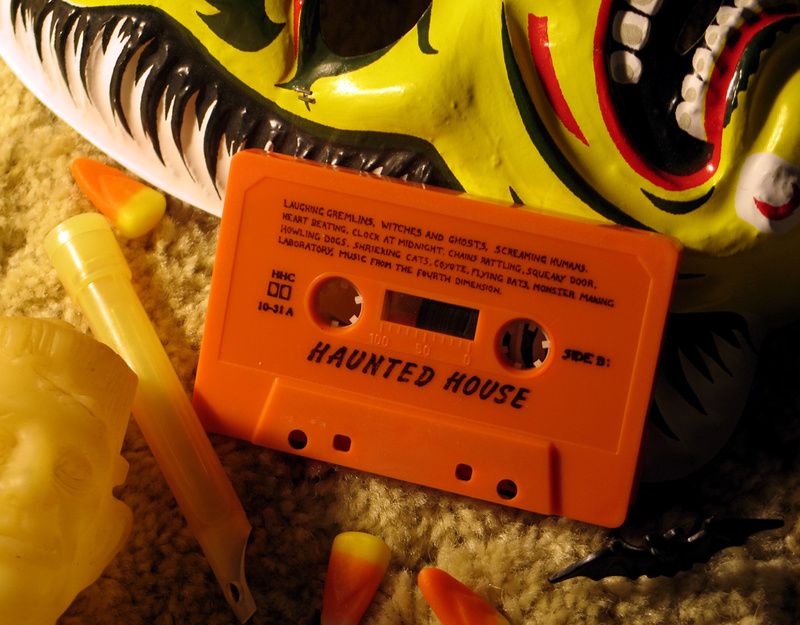 Rather than the jarring storms and explosions commonly found on Halloween tapes, the eerie tones on Haunted House create a trance-like mood, carrying you helplessly through a nightmare. The music feels so ridiculously familiar, but I can't confirm its source. 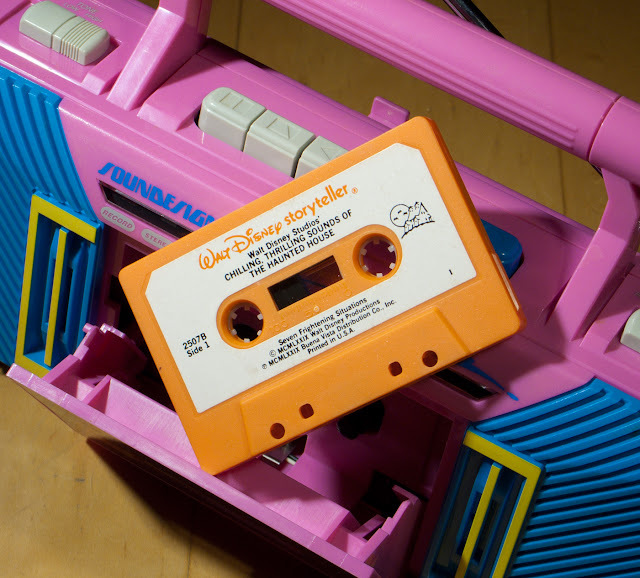 The track is listed as "Music from the Fourth Dimension" and is available on side two independent from any sound effects. It may be Spencer Moore's Capital Hi-Q library music, similar to what is heard in both "Teenagers from Outer Space," and "Night of the Living Dead." Any more info would be appreciated. I was watching it because it coincidentally features a lying shyster named Trump that talks about building a wall, and suing people before trying to skip town with everyone's money. Snopes article here. 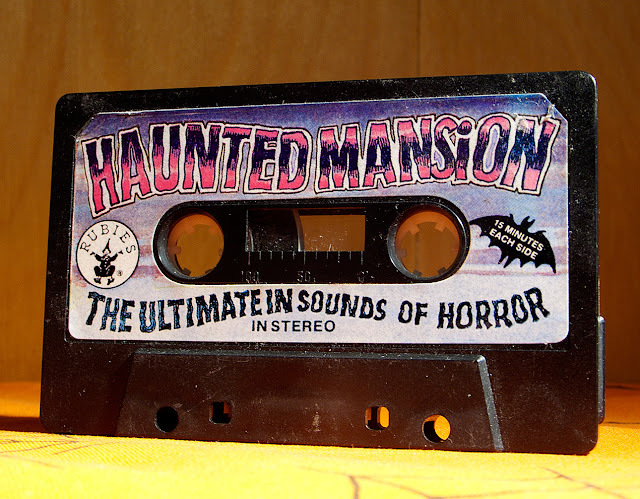 Haunted House is one of a series of three Halloween records that also includes Night in a Graveyard and The Ride of the Headless Horseman. 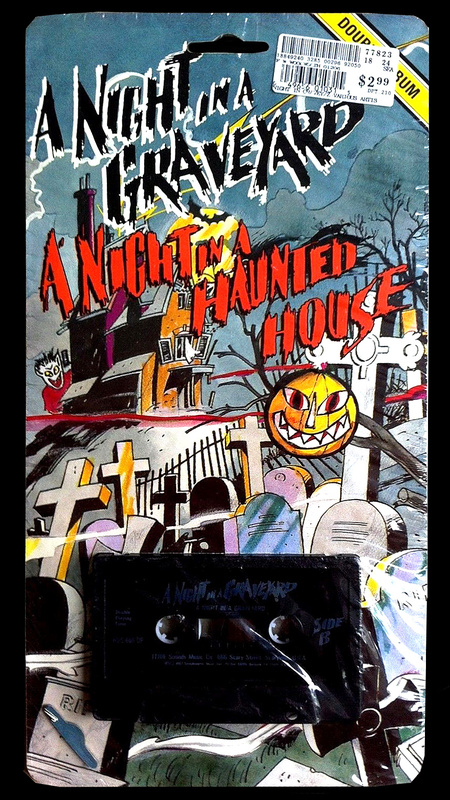 Both were released in 1985 under the corporate pseudonym Haunted House Music Co. The real manufacturer, Golden Circle Inc., put out dozens of cassette compilations, many of them unofficial, and most of them bearing questionable (yet lovable) graphic design. The blurry print jobs did them no favors. These are low-fidelity to the core, but this project seems wildly ambitious compared to the other Golden Circle releases. We're talking three original, long playing albums all released in the same year, all with original artwork. Maybe it's my imagination, but there's a sincerity surrounding these records that is uncommon. Is it possible that something more than money was motivating this undertaking? Whether that's true or not, Haunted House is a great example of Halloween magic on a budget from an unlikely source. 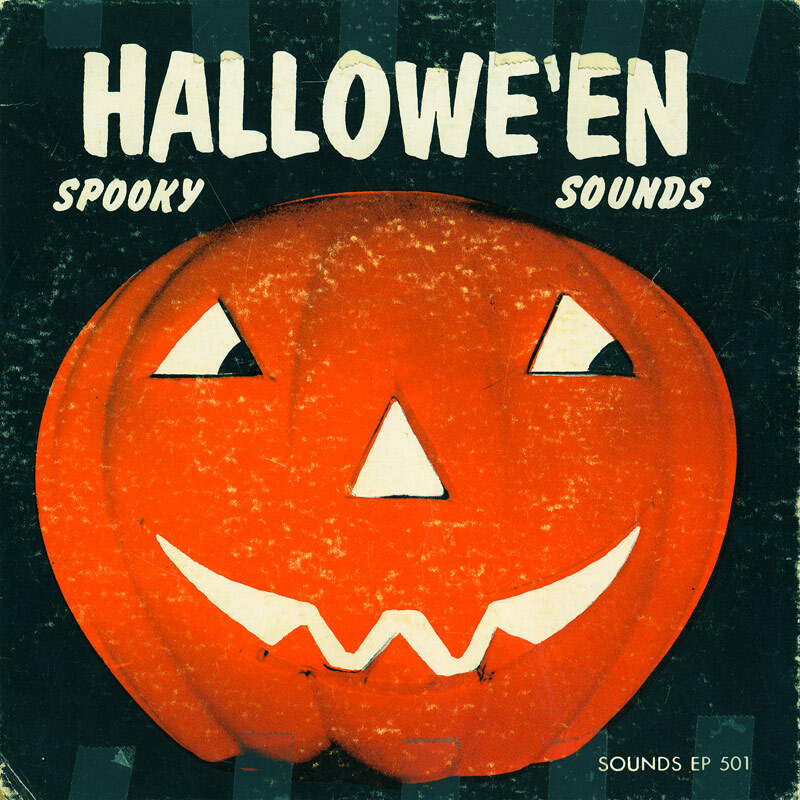 There's another release by Sounds Records that also claims a 1962 copyright called Spooky Sound Effects. 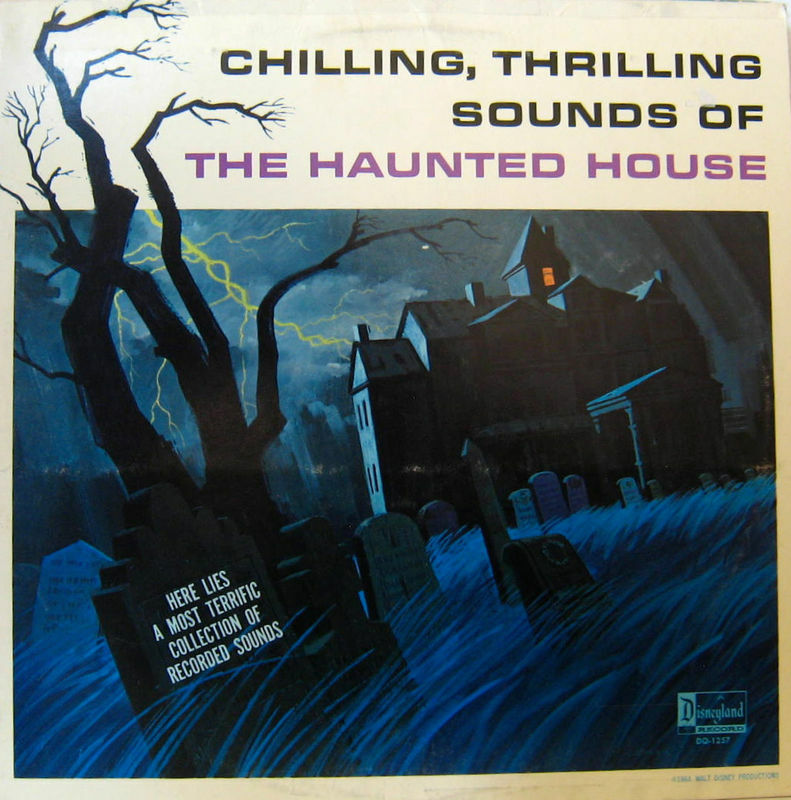 But that doesn't seem possible considering one of the tracks, "Storm, Wind, Cats, Dogs, Squeaking Door," is actually a recording called "The Haunted House" that was lifted from the 1964 Disney record and played at half speed. The '62 date may reference the inclusion of content from a third Sounds Records release called Music For Monsters. 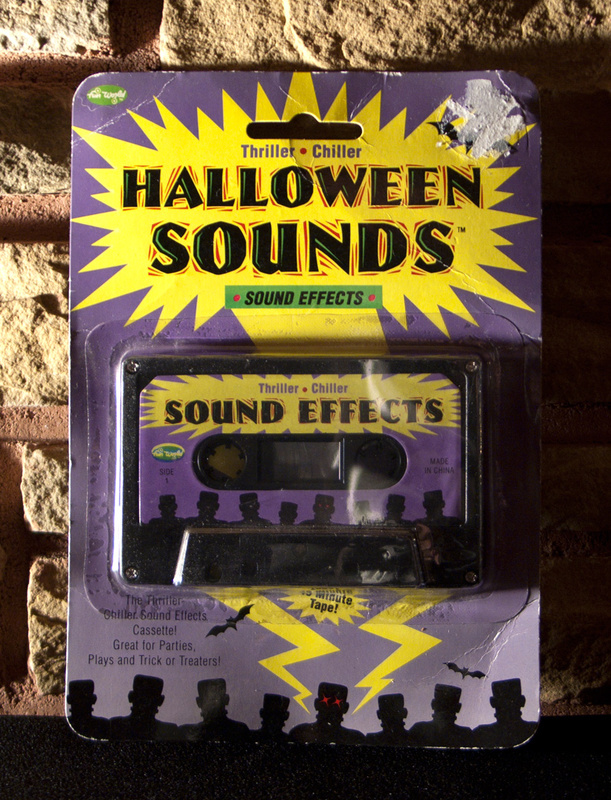 The 1979 version of Chilling Thrilling Sounds contains almost all new content. Side one is a series of vignettes called "Frightening Situations" and side two is full of "Eerie sound effects" that let you "create your own tales of terror." The biggest break from it's predecessor is the lack of narration. This gives each recording different functionality. Also different are fans' opinions as to which is superior. Both albums set the standard for Halloween records and are recommended to anyone who wants to hear Hollywood quality production values, and professional audio artistry that wasn't hindered by any lack of resources. 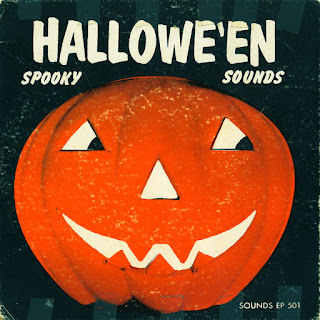 This isn't for everyone because the truth is, much of the appeal of Halloween records lies in their improvised nature. 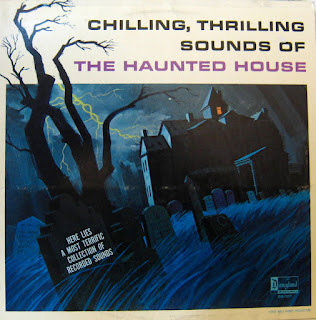 Chilling Thrilling Sounds will also disappoint anyone seeking a direct connection to the Haunted Mansion ride. Those listeners should look for the 1969 album called The Story and Song of the Haunted Mansion. Well, this is what happens when I get all caught up in facts and historic details— I forgot to make a single joke. Distinct Audio: The music. Also an extra loud rooster. Also the phrase, "You've entered the wrong door...and you're not coming out alive"
Review: You know the song that says "This is Halloween, this is Halloween?" Well, that's how I feel about this tape. The opening theme blew me away the first time I heard it. It has a somber, Dark Ages quality, but it's been filtered through the charm of a Casio. To me, those minor notes capture a sense of mischief and mystery like nothing else. After the forty-nine second melody ended I immediately skimmed through the whole recording wanting more, but it only repeats again at the tail end. As far as I can tell, the tune has no name, and there's no known writer or performer. It's as though the essence of the season was mystically forged onto magnetic tape. 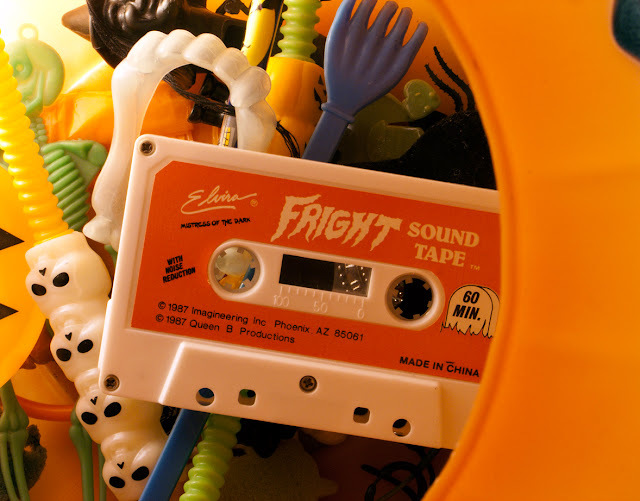 A couple years after I bought the album I heard the same music coming from a battery-operated jack-o-lantern in a Wal-Mart (back when it still had a dash in the name). 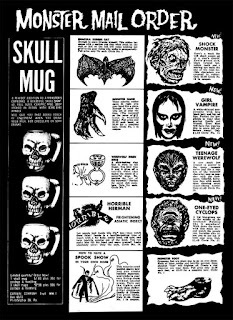 It was another Fun World product, leading me to wonder if it originated with the company. 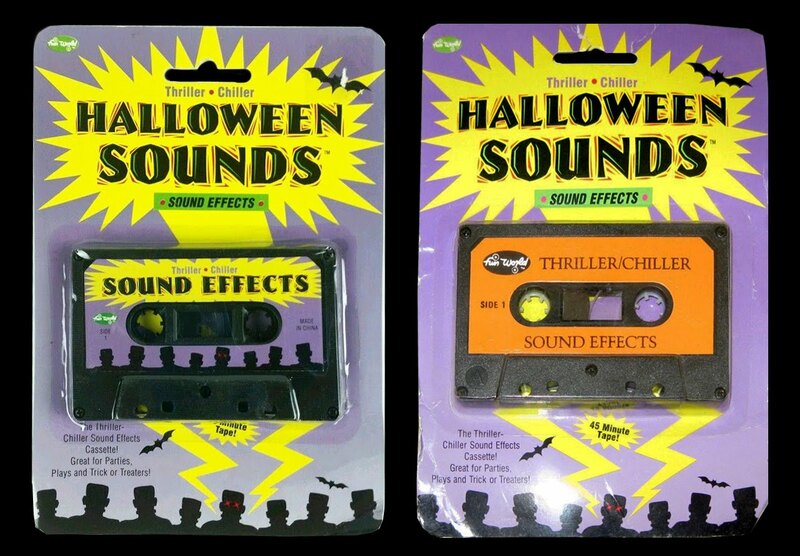 As far as I'm concerned, this is the "Jingle Bells" of Halloween. If only I can convince my family to play it at my funeral. My other theory is that Halloween sound effect tapes rank so low on the collective care-o-meter that nobody involved was willing to invest an extra shred of time or creativity. These albums are intended to be as ephemeral as the sticker on a rotten banana, or the cardboard you wrap around a disposable coffee cup to keep from burning your hand. Furthermore, understanding this fact of life is a healthy way of thinking that will prevent one from spending precious money on obsolete relics of yesteryear, or wasting hours listening to people who are now long retired, pretend to be monsters, or typing thousands of words that amount to a guessing game about what happened thirty years ago, with no real evidence to stand on. But that's just a theory. 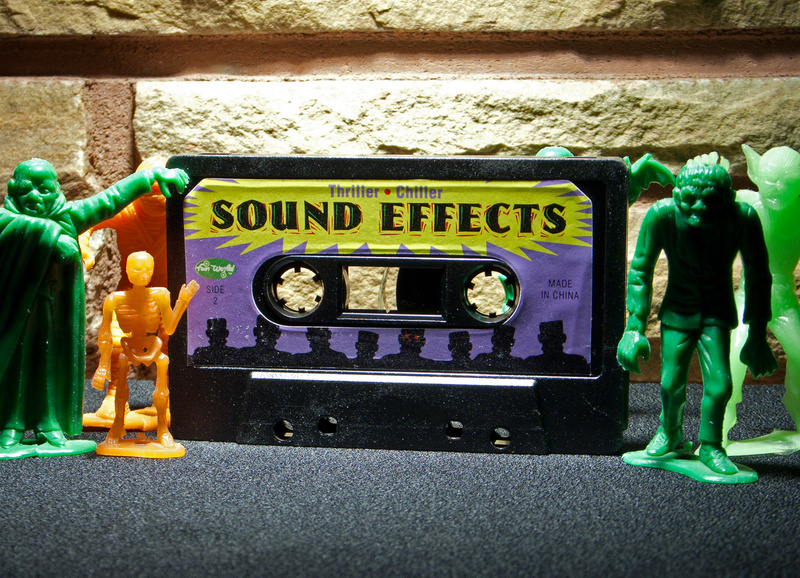 Manufacturer: Eerie Sounds Music Co.
Review: Under no circumstances should Halloween Party: The Halloween Party be played at a Halloween party. A lengthy series of isolated noises just isn't festive. Nobody on the dance floor will request an encore of “Owls Hooting” or “Glass and Crockery Breaking.” The only party where this album might be welcome is a gathering of nature lovers. All too many of the sound effects are either straight up wildlife recordings, or processed wildlife recordings with spookified names like "Goblins and Gremlins." That's like trying to pass "Ranger Rick" off as "Fangoria." The best thing about this misnamed record is the packaging art (see below). It served as an effective billboard that could compete with the best CD longboxes. I'm sure it would have charmed me out of my $2.99, though sadly, it was destined for the trash since they skimped on a cassette case. 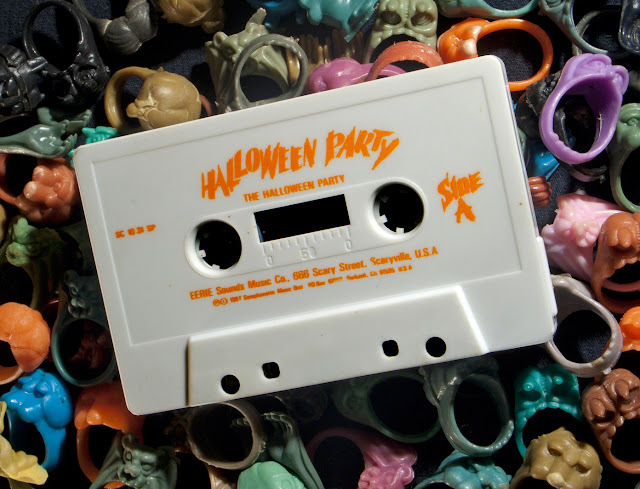 Halloween Party:The Halloween Party was released with a sister album called A Night in a Graveyard/A Night in a Haunted House. I'll bet it's more like a night in a zoo. EDIT: This will teach me to make judgements based on circumstantial evidence. Commentor BonOrbitz provided a link to Night in a Graveyard/Night in a Haunted House and said it's his "favorite Halloween cassette of the 80s. It's like Disney's '79 Chilling, Thrilling Sounds of the Haunted House, but much darker and an awesome narrator." Distinct Audio: There are a couple of bird freakouts. 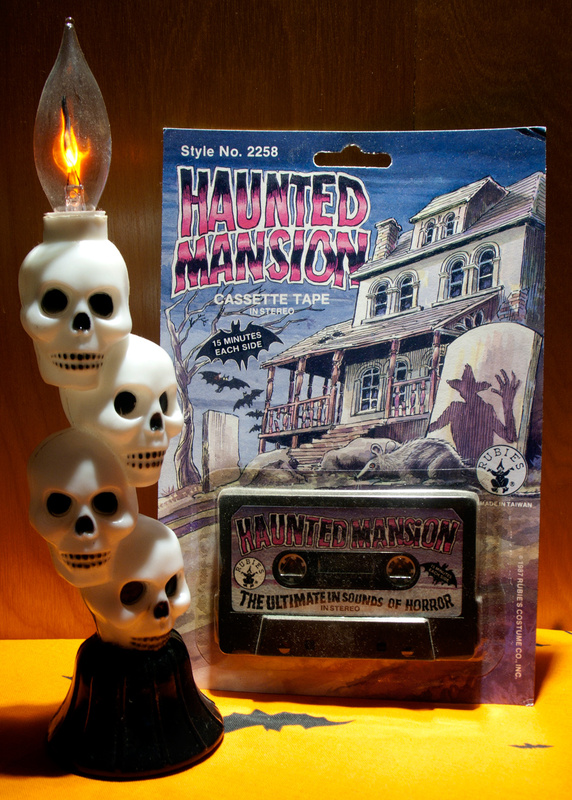 Review: This is the first of two tapes called Haunted Mansion that were released by Rubies. (The follow-up came out in 1992 and sounds similar, though not identical.) This seems to be another attempt at creating a false association with Disney quality. There's definitely no connection to the ride. They didn't even attempt to place the setting indoors. According to their web site Rubies is “the world’s largest designer, manufacturer and distributor of Halloween costumes” and has been around for 66 years. With those credentials, expectations are high. Did they deliver the goods? More or less, I suppose. I think the recording meets, but never exceeds expectations. The montage keeps the scary stuff coming at a steady pace. There’s enough agony present to steer it clear of "generic sound effects" territory. It's hard to tell if there's any original material here. I recognize segments from Haunted Horror for one. It sounds like they may have used the ol' "throw together a stew of lifted effects and call it our own" trick. Though there is something to be said for complete aural chaos. My biggest complaint is the erratic music. It’s like riding in a car with someone who can’t decide on the right volume. Once they finally turn it off and you try to strike up a conversation, they crank it up again. The best aspect of the product is the artwork, though sadly there is no signature nor credit given. The line work, the composition, the incredible hand lettering— everything works harmoniously to give us a perfect Halloween scene. 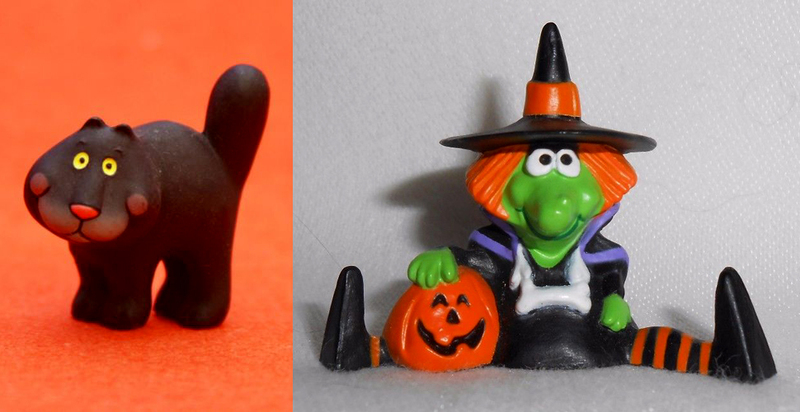 The shadow is likely inspired by Freddy Krueger, but even if it's just a handsy scarecrow, it's still pretty cool. Repeats on both sides: Maybe. I’m not sure. They sound really similar. Review: Halloween Sounds of Horror was produced by Viderex International LTD, the same company that gave us security killbots, and a leaked zombie virus. Seriously, what a perfect name for a malevolent corporation in a horror movie. 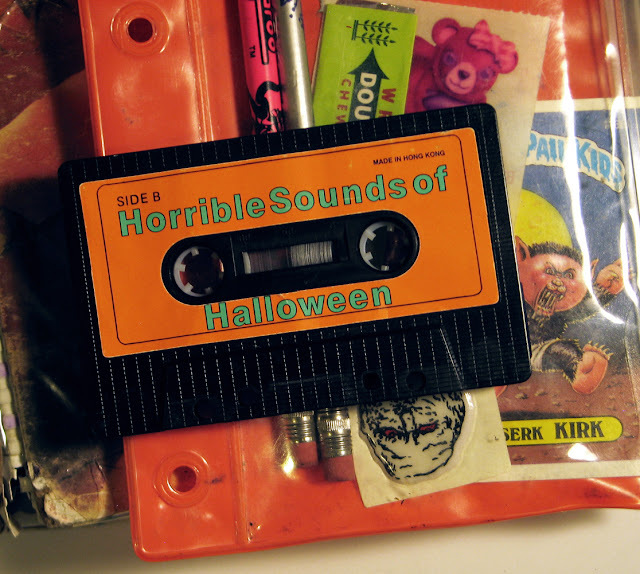 If I listen to this on Halloween night I expect my organs will turn into insects. My other qualm is the monotony. Processed laughter, alarm bells and thunder are in constant rotation. Granted, I’m sure there are some very specific circumstances where this is useful. 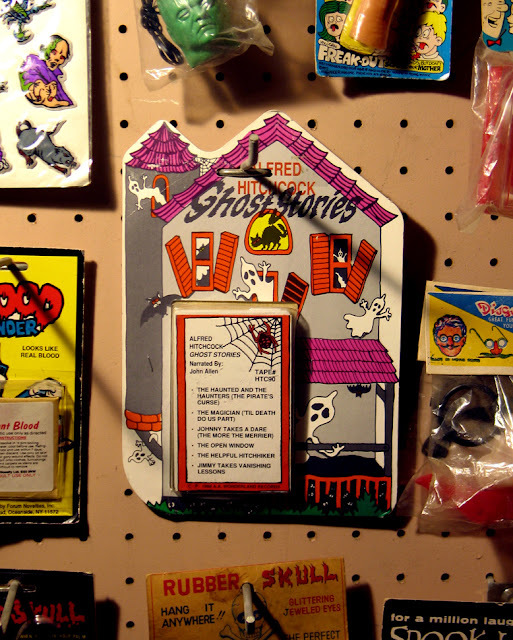 If your spookhouse has a small room with a laughing guy holding a haunted alarm clock, then this is the tape for you.